We have had the great privilege throughout the years to partner with some of the top professionals and celebrities; bringing each special event to life. Over the years, our catering company has had the honor of being involved in numerous events around Italy. Listed below is a small sample of a few of our favorite events we have been apart of. Giving something special to the people is a goal of ours; allowing them to enjoy themselves freely in a beautiful atmosphere, while we manage all the details & coordination to make it perfect. During the summer of 2015, Milan hosted the World Expo with a theme of Feeding the Plante, Energy for Life. 145 countries participated in the Expo, amongst the 21 businesses apart of the Expo, Dolceria del Corso Catering was one. With 22,200,000 in attendance, we put on a show for visitors all over the world, introducing them to the wonderfully unique cuisine of Italy. We guided our guests through the process of hand making Panforte; showing them the traditional methods to perfecting the ancient cake. We organized and planned the first annual New Year's party in the main square of Volterra: Piazza dei Priori. We quickly sold out tickets as over 3,000 local residents joined us to celebrate the New Year. We organized and planned a beautiful light show with the loudest sound system, a gazebo with a private area for our VIP guests and of course, the bar. We brought the main square of Volterra to life like no-one had ever seen before. A famous DJ played the perfect tunes for our residents who danced all night long in celebration of the New Year. 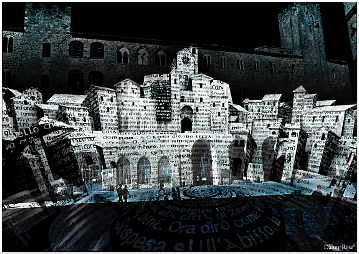 In the summer of 2011, we partnered with Volterra Teatro to organize a special event: The Festival of Light. As a dinner show directed by, Sergio Carrubba and Paola Ciucci, Dolceria del Corso Catering took lead in planning and organizing the dinner. We provided elegant Tuscan dishes to be enjoyed under the beautiful projections casted upon the buildings of Piazza dei Priori. With the artist, we planned a gorgeous, scenic event celebrating the 150th anniversary of the unification of Italy. In honor of Italy's birthday, Giancarlo created a cake roughly 2 meters in size on scene. Each year Volterra hosts its very own Medieval Festival honoring its historical history. 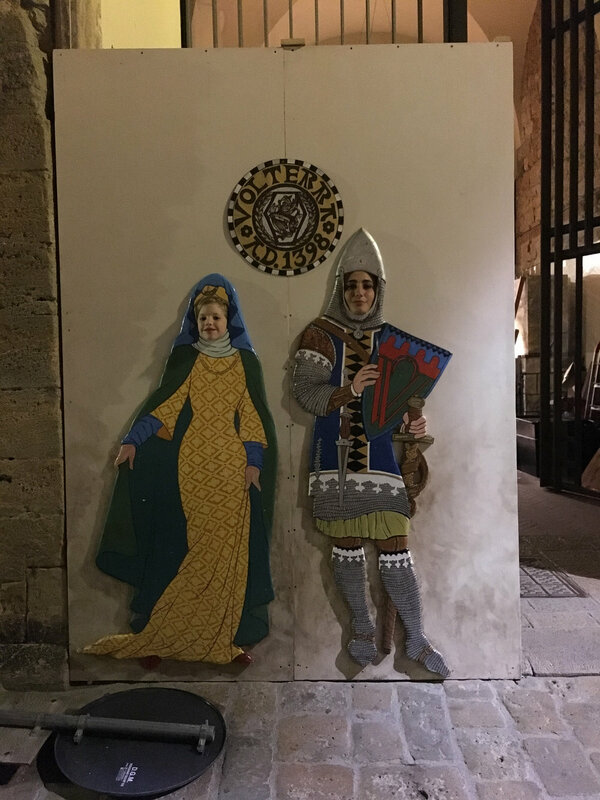 The festival focuses on the aspects of daily Medieval life; exhibiting local citizens in historical costumes, medieval reenactments, flag throwers, musicians, storytellers and most importantly pop-up food and wine shops with medieval glassware. Dolceria del Corso has partaken in the festival several times over the years. We have provided the locals citizens and tourists with cruise representing the historical period. Almost every year we travel to Mende, France for a mini expo, where we exhibit our local goods from Dolceria del Corso. As a Twin City with Volterra, we share the traditional goods of Tuscany: food, pastries, wine, oil and more. We also cater the celebration dinner; a 150 persons appreciation party celebrating the organization's elite partners, business associates and volunteers. Each year the dinner takes on a different theme revolving around Italy. Mille Miglia is great event hosted by Volterra to honor the historic passage of car racing. Hundreds of VIP guests from all around the world come to Volterra to exhibit their cars and attend the historical car race through the Etruscan hillside. Dolceria del Corso Catering planned and organized two very important meals for over 1200 VIP guests. We catered a private lunch and dinner for all 1200 guests on the hillside of the track to honor this historic race. Volterra is home to one of the oldest ambulance units in Italy. In the medical field, we have become the go to caterer for a large population of pharmaceutical companies and medical associations. As loyal customers, we have catered all their high profile events, public and private. Volterra's bank is one of the largest with over 200 branches across Tuscany. With several buildings owned by the bank, Volterra has become the central hub for financial conferences. The financial district has become a loyal customer of ours, as we cater all of their high profile events, public and private. Although small in size, Volterra has significant importance in the realm of business as one of the oldest cities to date. Large corporations have come to Volterra for its ability to house large conferences. Dolceria del Corso has been a vital partner to these conferences, catering all their events with the highest form of professionalism.